This drawing shows a number of designs for gun-barrels, and mortars intended to discharge an incendiary substance known as ‘Greek fire’, to burn the rigging and sails of enemy ships. The largest drawing, at the bottom of the sheet, shows a box-shaped mortar mounted on a small boat, which would probably have capsized when the mortar was fired. The long gun-barrels at upper centre were conceived as fine pieces of engineering, cast in sections to be screwed together. At the centre is a rotating cradle for mounting a gun with opposed barrels, so that one could be loaded while the other was fired. 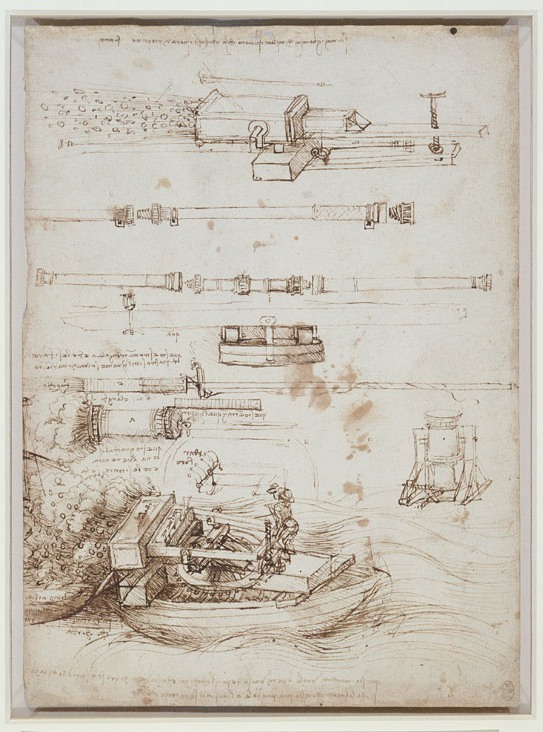 Milan was Italy’s leading centre for the production of arms and armour, and soon after Leonardo’s arrival in the city he began to sketch designs for all manner of weapons. It is unlikely that any of these designs was put into practice, and they may have been intended instead for an illustrated treatise on warfare.